March 3, 2014. 7:30pm. Ticket: $25. At the Goethe-Institut, 5750 Wilshire Blvd., Los Angeles 90036. Ample free street parking, as well as parking under the building with validation $1 after 6:00pm. If you’ve been to Paris and London, you cannot help but feel physically and emotionally connected to the distant past. Ancient Paris streets might now house boutiques, falafel stands and cafes. 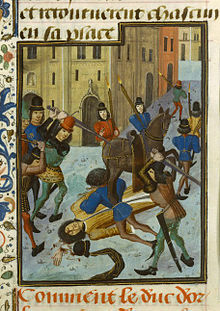 But historian and UCLA English Professor Eric Jager takes us through the Marais, down its busy streets to 1407, where the King’s brother, Louis d’Orleans, is savagely murdered by an organized band of axe-wielding men. No felafel stands stood then, but the streets were not so different from what they are today. To call Jager’s book, Blood Royal, “true crime”, doesn’t give it justice: it is history at its most thrilling and tactile, crime at its bloodiest, with consequences that would shake the nation and all of Western Europe. Louis d’Orleans was no ordinary prince—he was the regent, who steered royal political, military and financial decisions when his brother, King Charles VI, suffered from his frequent bouts of crippling madness. Enter Guillaume de Tignonville, the chief law enforcement official, who is charged with the task of finding the man behind the conspiracy. Jager uses original material, including centuries-old parchment scrolls dug up from archives long since forgotten, to explore the conspiracy to kill the prince. Jager takes us through Guillaume de Tignonville’s investigation—interviewing and searching the homes and businesses of neighbors, workmen, shop owners, dukes and princes. His investigation was so thorough that it risked his career, and his life. It is so thrilling it could well be fiction. But it’s not. Killing a prince is indeed dangerous and serious business. Toss in medieval London, Chaucer and the still young Richard II, and you’ve got us hooked. Throw into the mix some prostitutes, and a forbidden book, one that is seen to accurately prophesize the death of kings, a book whose simple but deadly verses are heard all over London. 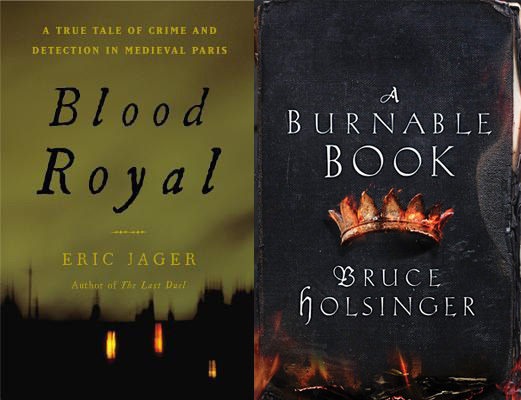 What you have is Bruce Holsinger’s A Burnable Book, a novel so rich in historical figures, and in historically true events, that you get a most wonderful education about who Geoffrey Chaucer really was, and why he was so worried about this forbidden book, whose author he needs to find most urgently. 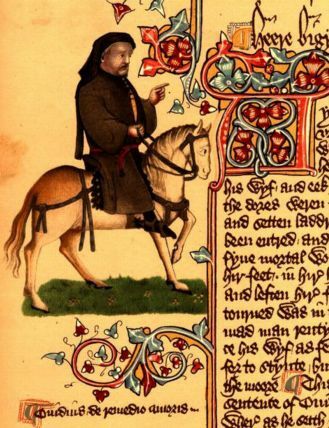 Some of us read and loved The Canturbury Tales in high school or in college, and we loved the wit, the puns and the social commentary with which Chaucer laces each Tale. Holsinger creates a starring role for Chaucer’s friend, poet John Gower, who was eternally eclipsed by Chaucer’s fame and powerful ties to the royal family. And those prostitutes just might possess more than they are letting on. This too is a story about corruption, princely power, murder and conspiracy. Although A Burnable Book is fiction, Holsinger layers his novel with so much historical meat that we might as well have taken a train to 14th century England. This entry was posted in Past Events, Program and tagged Featured. Bookmark the permalink.